Cold weather didn’t keep protesters from coming out for the Third Annual Sioux Falls Women’s March on Saturday. 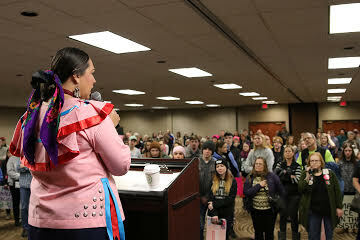 Due to negative temperatures, the march turned into a rally inside the Falls East conference room at the downtown Holiday Inn. The conference hall, with a capacity of 700, was nearly full with protestors sharing posters, socializing among activist and non-profit booths and a feminine hygiene product drive. Sandra Thompson, a woman from Sioux Falls who paints as a form of trauma therapy, carried a hand-painted sign with four recently elected congresswomen of color and a depiction of Rosie the Riveter as a woman of color. Although Thompson is not of color, she said she still lifts up women of color in support. “I really like the saying ‘the future is female’ because there are so many women who are running, who are getting elected nationwide for all types of political professions,” Thompson said. Marisa Cummings, USD’s Native American Student Services director, spoke on the prominent message of the rally: intersectionality. After introducing herself in her native language, she said voices excluded from the conversation are often times an afterthought and don’t allow an opportunity for what they can bring to the table. “We can’t be intersectional if the only one that you’re advocating for is yourself,” Cummings said. Cummings also took time to acknowledge the many missing and murdered indigenous women in the state. Rep. Linda Duba also spoke on missing indigenous women after a moment of silence in their honor. Saliya Leay, originally from Ethiopia, said she didn’t know what to expect from her first protest, but she appreciated the conversation about inclusivity. Marisa Cummings did not speak on behalf of her position at USD.